Apple founder Steve Jobs is credited as a genius who transformed and inspired millions of lives through his technology. 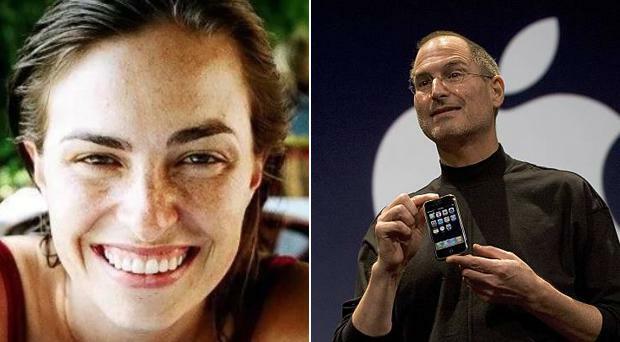 However, he had a disturbingly dark side, according to his daughter Lisa Brennan-Jobs, who had a difficult relationship with her father and charts their ups and downs in a new memoir, Small Fry. Lisa was born on May 17th 1978 on a commune farm in Oregon when her parents, who had met in high school in California, were both 23. While Jobs arrived several days after her birth to name her he refused to acknowledge she was his daughter, despite a DNA match. In her memoir Lisa recounts her childhood and their often-fraught relationship. A New York Times article about the memoir, featuring an interview with Lisa, describes Jobs as "vicious" to Lisa and "those around her". Speaking to Nellie Bowles for the publication, Lisa insists she did not want people to focus solely on the more troubling aspects of her father's personality and says she wanted to full represent "the dearness of and the pleasure" of being with him "when he was in good form". However, Lisa describes several troubling instances in the book. She reveals her father refused to install heat in her bedroom but in doing so, she says, he was not being "callous" but was rather instilling “a value system” in her. In the interview, Lisa insists such instances from her childhood were simply her father teaching her lessons. For example, when he insisted the Apple Lisa computer was not named after her, it was not a lie - he was teaching her "not to ride on his coattails". His daughter was not the only one to experience his "infamous venom". She describes one incident in which he turned on Lisa's cousin, Sarah, who had accidentally offended him by ordering meat. Jobs stopped his daughter when she attempted to leave the room. “‘Hey Lis,’ he said. ‘Stay here. We’re having a family moment. It’s important that you try to be part of this family.’ I sat still, looking away as he moaned and undulated.” she said. However, she said she never felt threatened by such incidents, insisting it was "just awkward". She also described how her father would upset her with his use of money. If she was in charge of his money, she claims she would give it away to the Bill and Melinda Gates Foundation. Small Fry is published on September 6 in Ireland.